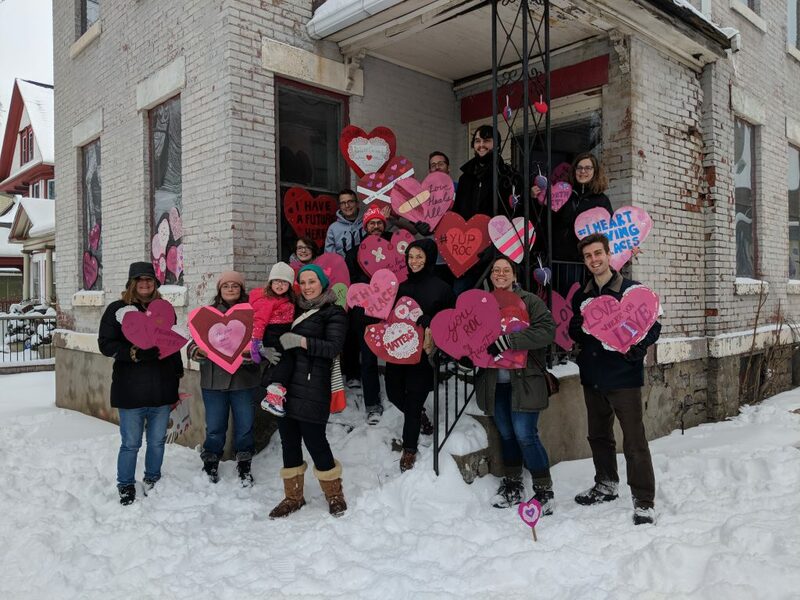 Each year, around Valentine’s Day, we pick a few buildings in Rochester that could use some love and we make festive valentines for them. 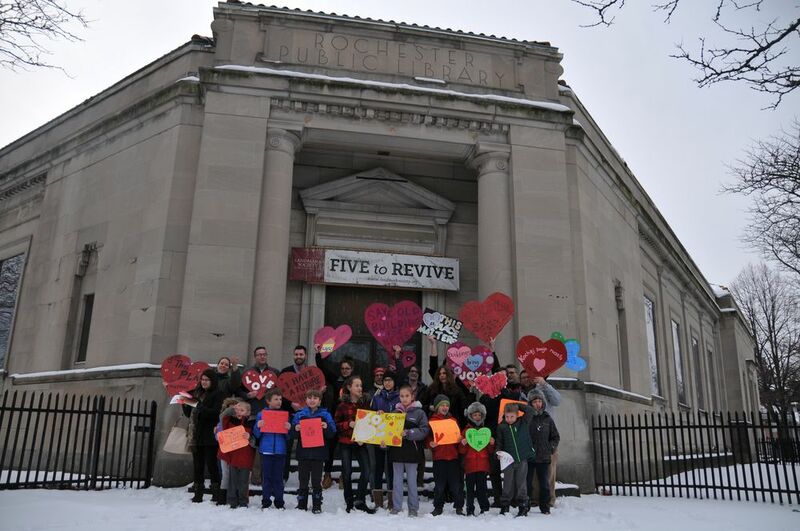 We then brave the frigid temperatures and “heart bomb” the buildings to bring attention to them and to show the larger community that these supposed “eyesores” have potential for reuse. We’ll be at it again on Saturday, February 9th. YUPs, kids of all ages, and families are invited to attend–we’ll provide a brief overview of what heart bombing and preservation are all about then we’ll hand over the valentines-making supplies. We provide crafting supplies but feel free to bring your own too! This is a FREE, family/kid friendly event and is open to all–children, adults, YUPs and non-YUPs alike! This year, we’re focusing our efforts on the former Driving Park Hotel in the Maplewood neighborhood (298-304 Selye Terrace). This bank-owned building is vacant and was added to the City’s demolition list this past summer. Do you have suggestions for other buildings in need of TLC? Email us. Saturday, February 9th | 12:30 PM | Maplewood Community Library, 1111 Dewey Ave.| FREE! If you missed our Open Meeting on January 10th, don’t worry, it’s never too late to get involved with the YUPs! We have several new positions and action items waiting for you. Preservation expertise is not needed; all you need is an enthusiasm for older places, history, and/or urbanist-related issues. Plus, now is an exciting time to get involved as we kick off Year 1 of our brand new Strategic Plan. >>Click here for a preview of their Year 1 Action Items. May 10-12 – Rust Belt Takeover: Milwaukee Edition – The YUPs meet up with other member of the Rust Belt Coalition of Young Preservationists to explore a new city! 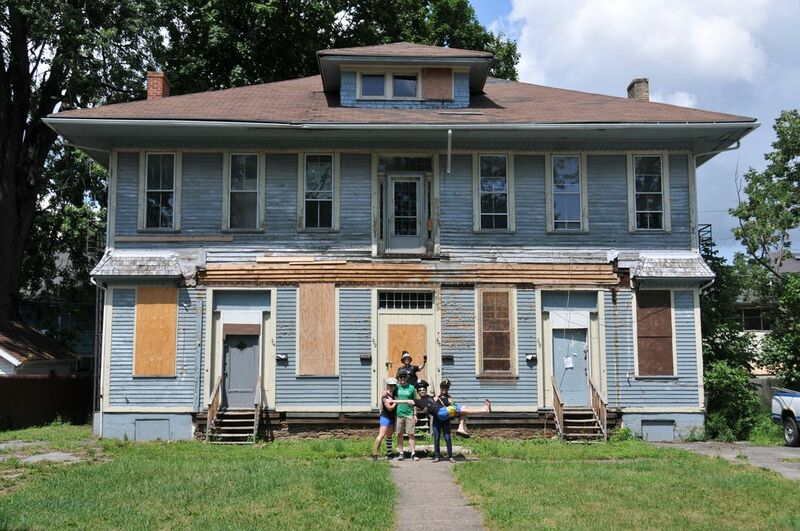 Introducing the Young Urban Preservationists! We are a group of young-ish folks interested in preservation and community revitalization. We come from various walks of life and various professions, but we all have one thing in common: we care about our Rochester-area communities and we believe our historic resources have an important role to play in making our communities dynamic and distinctive. The YUPs are also a member of the Rust Belt Coalition of Young Preservationists and travel to “takeovers” hosted by other young preservationists organizations in resurgent cities across the Rust Belt in order to share & celebrate preservation’s role in community revitalization. Sign up for our e-newsletter below so you can stay up-to-date, and contact Caitlin Meives, Preservation Planner if you’re interested in learning more and getting involved! You can also follow us on Facebook and Instagram! And check out our #yuproc hashtag on Instagram!